Talking About Migraine at Work: Your Thoughts? Educate your coworkers—because they don’t know what migraine is, they don’t know how disabling an attack can be. The article recommends getting pamphlets from your doctor to share with coworkers. Talk to your manager—to reduce triggers by modifying your work environment and gain access to a dark, quiet room during an attack. Be honest—say that migraine attacks can be disabling and you hate to miss work. Tell coworkers that you miss out on fun activities, too, not just work. I haven’t worked in an office in 13 years, but these recommendations strike me as idealistic and tone-deaf. Other than the suggestion to be honest that you don’t like to miss work because of a migraine attack, this advice raised more questions for me that it resolved: Is it really a good idea to tell your coworkers and manager that migraine attacks can be massively debilitating? Is a person with migraine responsible for educating coworkers? Will pamphlets be fodder for gossip? Do coworkers even listen to attempts at awareness-raising? Are managers receptive to requests for accommodations? Do coworkers care if your migraine attacks prevent you from enjoying leisure activities? I’d love to know what you think. Please leave a comment below (or if you get posts by email, reply to the email with your response). 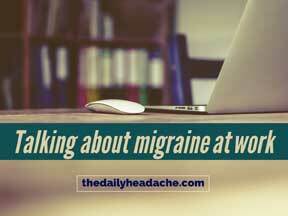 7 Responses to Talking About Migraine at Work: Your Thoughts? I was lucky to have a very understanding and flexible work environment when I first started getting attacks – my partner and I only had to answer to each other – our “real” bosses didn’t really care who was in the office so long as the work was getting done. Eventually, however, my partner got sick of picking up my slack. He’d refer to me as being “low energy” (true, obviously) and I think started to feel I was malingering. Now I’m freelance. I’d like to get a full time job, but the thought of trying to work through an attack is horrifying – I don’t think I could at all. Funny sidenote – I used to lie in bed and hallucinate that I was at work – in my mind I was making the calls and taking the meetings that I couldn’t in real life. Anyone else ever hallucinate like that with migraine? I’m retired from the US Federal government. These are excellent ideas. I ended up having to do all of these things as well as educate my immediate manager about reasonable accommodation and leave policies. Management is concerned primarily with whether a migraineur will do the job and whether he or she will reflect well on the business. *Every migraineur I have ever known* has been a conscientious worker willing to make deadlines and make-up lost time. Those things aren’t lost on management. The one thing that I believe every migraineur should do to CYA is to procure a clear letter from the doctor about their condition. Every employee who wishes to call in sick with migraine should be required to produce of letter of diagnosis at the very least. Migraine is not just a headache. We must be as willing to work with management as we would have management work with us. This year will mark ten years for me since I’ve worked at all. The last two years before disability retirement were hell. The law is on our side. We have to work the laws and our jobs too. There’s no way around it. Agree with your assessment that the recommendations are overblown. In my experience sharing migraine information with one’s boss is the most important base to cover. As a boss who managed employees with migraines, and as an employee dealing with migraines, this was critical information to share. It let the right person know about what to expect when migraines hit. I never thought it was an option to not work due to my headaches and I didn’t talk about them. Not even my boyfriend of over 5 years truly understood my migraines until about a year or two ago. This past year I finally opened up to my employer about them and sought intermittent FMLA and since I was finally on my own insurance (as I finally turned 26) I sought a referral to a Neurologist, got an MRI done, etc. Basically it has pros and cons to tell people at work about them. I would pick people you really trust and your boss and tell them if you feel comfortable and you feel you have a good rapport with them, otherwise it’s not anyone’s business. I actually have done exactly this at work, though I have taken it a step further. I have a personal policy that when I come to my employer with a problem I provide a proposed solution or plan. My supervisor knows I get back migraines, as does my treatment team. So there is an understanding at meetings that I might need to take my medication. I also work a job where I have flex time. So if I have a horrible migraine I usually make up the time. If I get it before leaving for work I explain to my supervisor I will update her and there is a good chance I will be in later in the day. I set up times to check in with her and make the call as to whether or not I’m coming in that are easiest on the team. Being proactive and having a plan, and in the process of disclosing a chronic illness at work making it less work on the employer goes a long way. If you show that you are willing to find ways to continue to pull your weight and take responsibility for your condition it changes the dynamic. I’d like to add that when I returned to my agency after being on long term disability I was at a new job site and still having migraines daily. I was promoted in less than a year. It is possible to disclose to an employer and have it go well. Also interestingly, a lot of my clients know about my headaches as well. Therapy can quickly go sideways if I start having an aura, or I’m seem less engaged. I also use it as an appropriate self disclosure tool in regards to coping skills and medication adherence. Absolutely, communication is key. It’s unfortunate that we live in a world where people fear having these kinds of conversations with their employers or managers. But this is very good advice, and most likely, you’ll find your employer to be very accommodating. I’m on the fence if I think it’s a good idea to disclose or not. I have been suffering from chronic migraines (above 7/10 from 17 to 28 days per month) for about four years. My immediate leader Is aware of my condition and is very supportive as are my co-workers. I push through as often as possible and even work at times when I probably shouldn’t because it likely prolongs the worst of the headache. I worry a lot about no longer being the consistent dependable employee I’ve always been. I did provide my employer with a letter from my doctor outlining the condition and need for occasional time off. Recently I was having a particularly bad couple of months and was trying to avoid a short term leave because we were short staffed and I knew we would have a hard time being down one. I wrote a detailed email to my manager and health/wellness deptartment to advise that I was struggling and using my paid time off to minimize my workweek to try to proactively manage my symptoms and reduce sick time accruals. I asked for suggestions and offered suggestions that might make my workweek more manageable. I was offered no suggestions and advised that mine could not be accommodated. Even at home, I’ve always been very independent and hands on. I keep busy with projects and enjoy everything from sewing to building. I’d stopped any extra activities and after making it through a workday would have nothing left, I would get home and go directly to bed. My home life and time with my kids were suffering because it took all of my energy to make it through a workday. I did end up taking a short term leave with little to no change in my symptoms. My leave will be up soon and I will be back in the same predicament. Ultimately, it is likely better that they know even if they are unwilling to help me manage my symptoms. I at least gave them an opportunity to human.